Removable 1-1/4” tubular handle (Except Model BG) with smooth radius bend mounted into a 12 gauge mount with handle sockets. 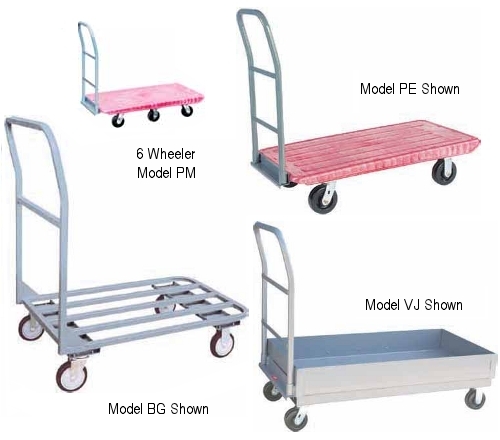 Bolt on casters, 2 swivel & 2 rigid, for easy replacement and superior cart tracking — see specifications chart (except Model PM). Durable structural foam plastic platform. Flush platform for easy load and unload. Platform height – 10” (14” with full pneumatic casters). Casters — 5” x 2” (bolted on) — 4 swivel at ends & 2 rigid in middle see specifications chart. 1” square tubular construction (14 gauge). Platform height – 8” (12” with full pneumatic casters).